Leyland club captain David Makinson has demanded more from his batsmen ahead of this weekend’s derby clash against Chorley at Fox Lane. 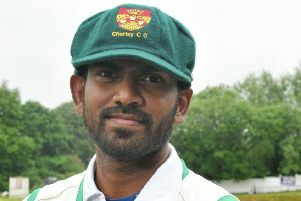 The weather came to the team’s rescue last weekend after they were bowled out for a paltry 113 against St Annes at Vernon Road. Fortunately, the incessant rain never allowed the home side’s reply to get under way and the match ended as a draw. Makinson – who is still out of action nursing a shoulder injury – is certain his men would have gone down to defeat had the rain relented. And he is under no illusions that a similar batting display this weekend will end in Chorley claiming the bragging rights. “We definitely got out of jail against St Annes,” said Makinson. The wicket was a decent wicket. We just batted really poorly right from the beginning. “I don’t think we would have won. We would have had to bowl really well, but we were without Karl Cross, Andrew Jacques, myself. That’s three of our main bowlers not playing so we would have done well to win it after posting that score. Chorley are in fourth spot in the table and will provide stiff opposition. 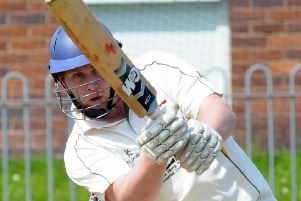 Andrew Holdsworth’s men had the better of the earlier league match which ended in a draw and have won both T20 games, although Leyland did win the Lancashire Cup game between the pair. “They beat us in the T20 Cup and were on top in the league game, we just got the better of them in the Lancashire Cup, so we will try and earn another win again this weekend,” said Makinson. NORTHERN LEAGUE DIVISION ONE: Fleetwood v Blackpool, Leyland v Chorley, Morecambe v Preston, Netherfield v Barrow, Penrith v Fulwood and Broughton, St Annes v Garstang. MOORE AND SMALLEY PALACE SHIELD PREMIER DIVISION: Croston v Great Eccleston, Eccleston v Lancaster, Kendal v Longridge, New Longton v Thornton Cleveleys, South Shore v Torrisholme, Vernon Carus v Penwortham.